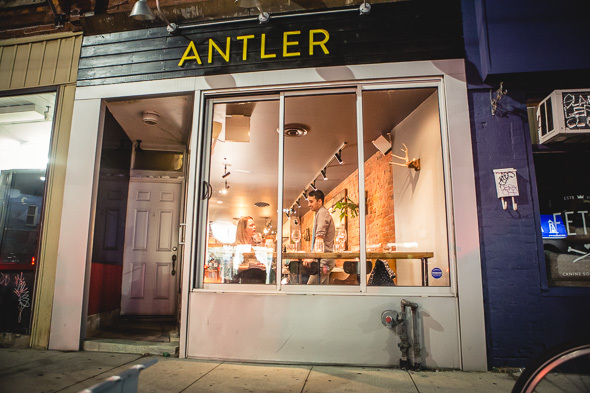 Antler is a rustic restaurant in the space formerly occupied by This End Up. 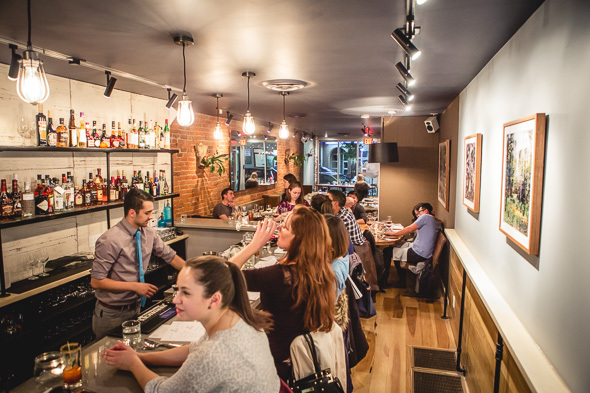 The focus here is on foraged ingredients and game meats. It's the newest effort from the serendipitously named chef Michael Hunter and Jody Shapiro who channel a lifelong love of hunting and gathering to share with Toronto diners. Of course the meats served aren't exactly hunted per se, as serving wild game in restaurants is a practice outlawed in Canada (with the exception of charity dinners). The 40-seat room is furnished with wood church pews and chairs upholstered with sisal. Photos of syrup buckets, sprouting mushrooms and forested scenes adorn the walls to set a cozy cabin-like ambience. 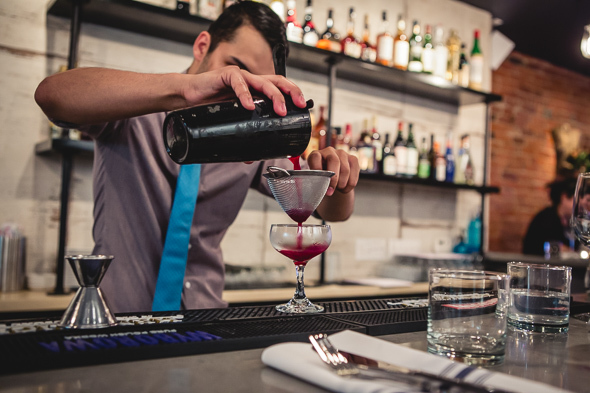 Opening with cocktails is well advised and I can't speak highly enough about the Kordonis ($14), a gin based beverage blended with beet purée and sumac and basil simple syrup. It's sweet, tangy and earthy all at once and evokes memories of eating pickled beets from a jar - I'm really into it. 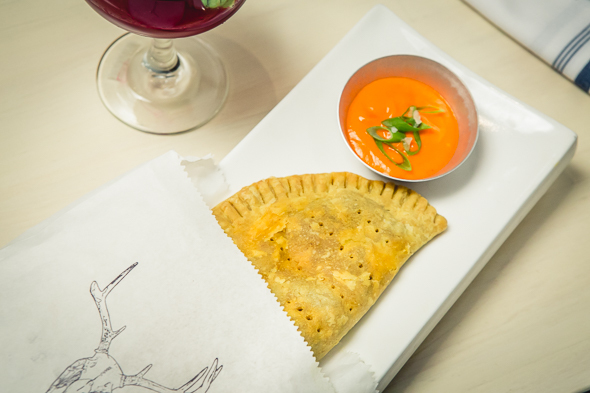 To start there's a wild mushroom tarte tatin ($8) and a Jamaican venison patty ($8). The former is a delicious example of foraged ingredients found throughout the menu, while the latter offers a creative riff on a classic street food served in a paper sleeve. Both offer light flaky pastry with savoury fillings and are exactly the kind of food I want to eat in colder months. 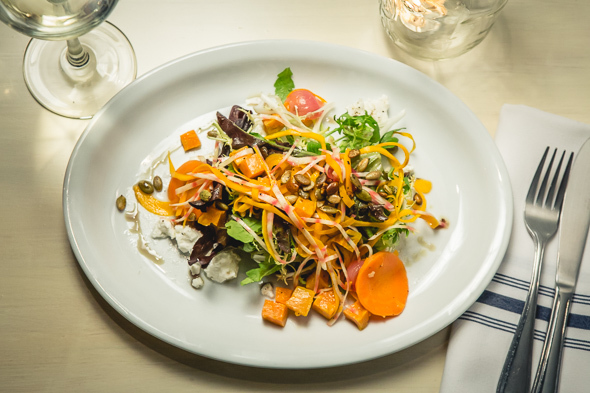 The harvest salad ($12) is composed of tangy pickled squash and pickled onions paired with soft Portuguese goat cheese and peppery radish greens. Pepitas add a welcome crunchy element and overall the balance of flavours and textures works well. 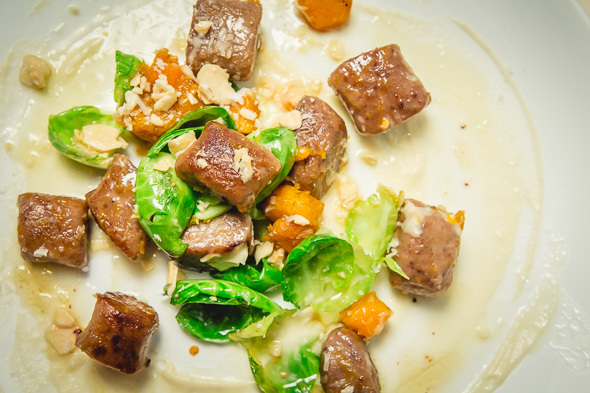 Handmade pasta is impressive, particularly the chestnut gnocchi ($19) sauced with brown butter and served with parsnip purée, roasted squash, brussel sprout leaves and garnished with almond brittle, parmesan, and sage. I'm less a fan of the pappardelle with braised rabbit ($22) paired buttered leeks with apricot preserves and parm. 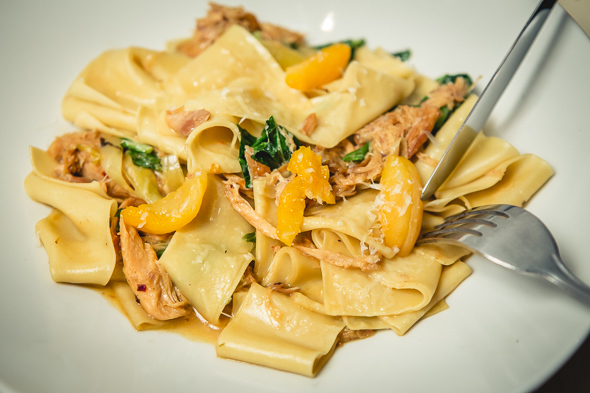 The wide flat noodles are lovely but the strong sweet and tangy flavour of the apricots kind of overpower the tender rabbit. 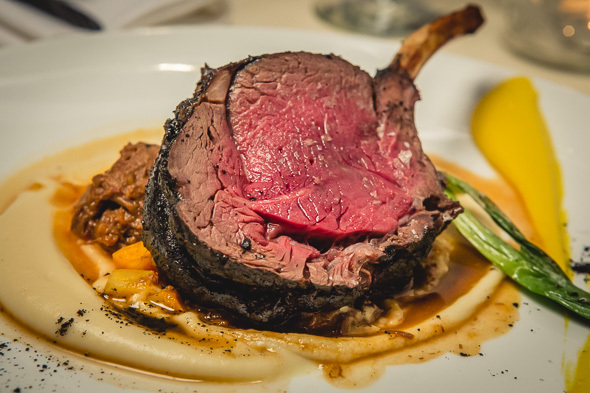 Spiced ash crusted rack of deer ($38) is presented over parsnip purée with Swiss chard. The meat boasts a beautiful warm red centre but the ash crust offers a distinct flavour that is not unpleasant but its grittiness is unusual. 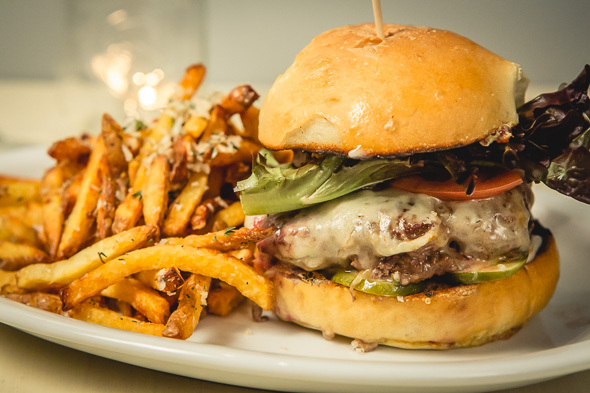 There's a burger ($18) too, only instead of beef, the thick, juicy patty comprises game meats including wild boar, bison and deer. It's topped with hot mustard, garlic aioli and house smoked cheddar. Overall this dining experience has been an adventure - and that just might be the point. I didn't fall in love with everything I tasted, but the cuisine is accomplished for sure and the brief escape from city life was a welcome change of pace.